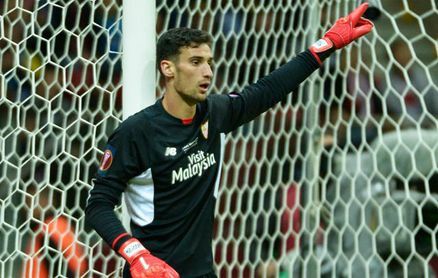 According to reports in Spain via the Metro, Unai Emery is ready to raid his former club after Arsenal expressed their interest in signing Sevilla goalkeeper Sergio Rico this summer. Emery is wasting no time overhauling the squad he inherited from Arsene Wenger and our new head coach is looking to bring in a new number one to replace Petr Cech. The Czech legend is now 36 and is certainly showing his age as his form was poor last season and David Ospina hasn’t done enough to convince that he’s the answer to our goalkeeping issues. So a new reliable stopper is needed and while we’ve been strongly linked with the likes of Bernd Leno and Jan Oblak in the media, it seems Emery is also eyeing a one of his former players. The Metro are citing a report from Marca that claims Arsenal have expressed an interest in signing Rico as Emery prepares to raid his former club for their number one. Rico has been a mainstay in the Sevilla team for the past four seasons and worked closely with Emery during his time at the club when they won two Europa League’s together. The 24-year-old impressed last season during Sevilla’s Champions League victory over Manchester United and has also been capped by the Spanish national team having been part of their Euro 2016 squad. TeamTalk reported recently that Sevilla value Rico at around £18m so he’s well within our budget but Marca’s report says Arsenal will face competition from Watford as the Hornets are also keen on the Spaniard. Personally, I’d prefer us to go for Bayer Leverkusen’s Bernd Leno but it’s just good to hear reports that we’re after a new goalkeeper as we desperately need fresh legs between the sticks next season. I’m expecting a busy summer as Emery has already snapped up right-back Stephan Leichtsteiner from Juventus and we’re reportedly closing-in on Borussia Dortmund centre-back Sokratis Papastathopoulos.